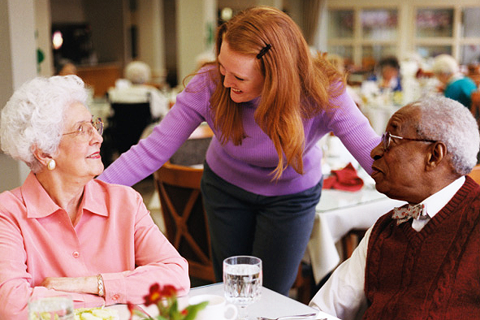 Assisted Living Facilities are places where Veterans can live in a rented room or apartment. There are some shared living spaces, like a dining room. In some facilities the Veteran could have their own kitchen or kitchenette. There is a trained caregiver on duty 24 hours a day, 7 days a week. This person can help the Veteran with activities of daily living (e.g., bathing and getting dressed). Veterans may also be able to have the VA arrange for a health professional (e.g., a nurse) to visit and give them extra care. The VA does not pay for the Veteran's rent, which usually includes basic services. However, the VA may pay for some of the extra services the Veteran may need in an Assisted Living Facility. Am I eligible for an Assisted Living Facility? Assisted Living Facilities are not provided or paid for by VA. Your eligibility is based on clinical need and setting availability. Your VA social worker or case manager may be able to help you with eligibility guidelines. You will have to pay for the Assisted Living Facility yourself or through other insurance. Your VA social worker/case manager can explain any services that you may be able to get while living in an Assisted Living Facility that could be paid for by VA.
You can also talk with a VA social worker to help decide if you will need extra help from a nurse or aide at the facility. Deciding to move into an Assisted Living Facility is an important decision for you and your family. If an Assisted Living seems right for you, your VA social worker may be able to help you locate options in your community. You can also use the Locate Services and Resources page, found on the left navigation menu, to help you locate Assisted Living facilities. At the Assisted Living Facility I can be social or have my privacy. I enjoy doing some cooking for myself and knowing my family can go about their busy lives without worrying about me. I travel a lot for my job. It helps me sleep better at night knowing that my dad is not alone and that he's getting the help he needs.